Highways Magazine - Could the pothole crisis be on the mend? Could the pothole crisis be on the mend? Drivers are two and a half times more likely to breakdown due to potholes than in 2006, according to the RAC. And by way of a reminder - in case you needed one, which you probably didn't - last year's ALARM survey saw highway authorities in England and Wales estimate the local maintenance backlog or one time 'catch up' cost was £9.3bn. RAC patrols dealt with 1,714 breakdowns in the last three months of 2018 that were likely to have been caused by potholes or poor road surfaces - including incidents of damaged shock absorbers, broken suspension springs and distorted wheels. The Pothole Index, which is the RAC’s long-term indicator of the health of the UK’s roads, is currently at 2.5 - this means drivers are still two and a half times more likely to suffer a pothole-related breakdown than they were when the Index was started in 2006. The Index is a 12-month rolling measure of the share of pothole fault breakdowns compared to the 2006 baseline, corrected for seasonal weather effects and improving longer-term vehicle reliability. It excludes punctures. In addition, an RAC Freedom of Information request to councils in England, Scotland and Wales found 512,270 potholes were reported for repair in 2017 to 161 authorities - an increase of 44% on two years earlier. The good news is that the ALARM survey's £9.3bn in 2018 - soon to be updated in March this year - was actually a fall of 23% on the 2017 figure of £12.06bn. On top of this In other news, data obtained under the Freedom of Information Act by Insurance Emporium found a 27% reduction in the number of potholes on the local road network from over 1 million in 2016 to 780,000 in 2018. And even the RAC figures look positive when you look at the detail. In the third quarter of 2018, the index was at 2.63 so the latest figure is not only an improvement but also represents a third successive quarterly fall. Also, the number of call outs in the last three months of 2018 was the joint lowest percentage share of pothole-related faults seen by the roadside rescue organisation in the fourth quarter of any year since 2013. The call outs registered at 0.8% of the 217,966 breakdowns the RAC attended between its 2.1 million members. Looking at 2018 as a whole, RAC patrols attended 13,093 breakdowns related to poor road surface conditions which equated to 1.4% of all RAC call-outs – the lowest percentage recorded for any 12-month period since October 2017 (Q3 2017 – also 1.4%). The record high for the RAC Pothole Index figure was 3.5 in Q1 2010 when motorists were 3.5 times more likely to breakdown due hitting a pothole as they were in 2006. Despite the early signs of improvement, commentators have been cautious and stressed that further funding reforms are needed to consolidate and maintain any local improvements. These include further long-term funding security measures to allow councils to better plan maintenance regimes. There is also the fact that filling more potholes is not the only benchmark for good road condition. Councils could be just fighting fires, while the overall condition is deteriorating - meaning that while there are positive signs in the short term, long-term improvement could be at risk. 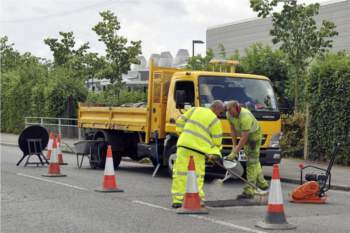 RAC breakdown spokesperson Simon Williams said: 'Data gathered from the breakdowns RAC patrols attended in the final three months of 2018 shows a slightly more encouraging picture in relation to the quality of UK road surfaces. Unfortunately, while this is better news we are far from having the beautifully smooth roads that motorists would like. 'We believe central government needs to give councils increased money for roads by ring-fencing a proportion of the existing £28bn they receive in fuel duty every year. Mike Harper, RSTA chief executive, said: 'The fact is that potholes are a failure to undertake planned programmes of maintenance. A well-maintained road will not have potholes. 'Successive governments have failed to understand the economic and social importance of a well-maintained local road network and have failed to provide local authorities with the necessary assured funding to carry out planned programmes of maintenance. The result is that councils are playing a never-ending game of pothole patch-up.